High swell events can develop far from the coast under cyclonic conditions, and take several days to travel to land. If early warnings are not issued, they can take an area by surprise and have a devastating impact. This lesson aims to improve the ability of marine forecasters to forecast extreme marine events related to high swells. It does so by providing background information on winds and waves, and presenting a process for monitoring and forecasting high swell events using a variety of data. These include ASCAT scatterometer wind data and the ECMWF Extreme Forecast Index (EFI) product, which helps verify model output and improve the quality of heavy swell forecasts. The forecast process is applied to two cases that occurred on the Moroccan Atlantic coast in 2014. 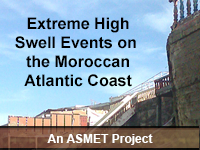 Note that the lesson has been developed with funding from EUMETSAT for the ASMET project. The lesson was more challenging than I had anticipated. This is because is my first time to learn deeper about significant wave height that I am familiar with. Since 1995 when I first plotted a Swell wave in the charts. A very good presentation about extreme high swell events and the way forecasters should deal with them. Putting some audio to the lesson would be helpful. Interesting and relevant case studies used to build skills and give insight into the basic marine forecast process.